Want more traffic this holiday season? Odds On Promotions can help! We have dozens of creative, holiday-themed contests and promotions that will help you capture attention and drive traffic from Thanksgiving right on through to New Year’s Day. And best of all, when you have a big winner, we’ll be there to pay for the prize – up to $1,000,000! Put a whole new spin on your promotions this December with Odds On's Holiday Spin & Win and winter-themed customizable Super Prize Wheel! Insurable up to $1,000,000, simply qualify your players and give them the chance to spin the wheel and score a prize! Best of all, when a lucky player racks up a winning combination on the Wheel, Odds On will be there to write the check. Make this one even more entertaining by having a Santa emcee and "elves" award gift cards to each contestant ensuring everyone's holiday wishes come true! Stand out from the crowd this holiday season by giving your players the chance to win amazing cash and prizes with Odds On's electronic-Game Board promotions. Available in a variet of kiosk sizes ranging from larget scale 8' x 10' or smace saving 4' x 8' models. If a lucky player can select a winning combination of cash or prize symbols, they'll hit the jackpot, and Odds On Promotions will pick up the tab... up to $1,000,000! All electonic-Game Boards are available as a standard game board, paired with a set of Lucky Envelopes for each contestant. What better way to drive traffic or reward consumers this December than giving them the chance to win $1,000,000 or a series of cool gifts! With Odds On's fast-paced and action-packed Winter & Holiday themed Zoom Ball, if your player lands a winning combination of balls in the Zoom Zone, they'll win cash and prizes worth up to $1,000,000 - and Odds On Promotions will write the check. Award iPads, HDTVs, points, slot play, and other consolation prizes based on how many balls end up in the Zoom Zone. Need to drive traffic at your property during the holiday season? 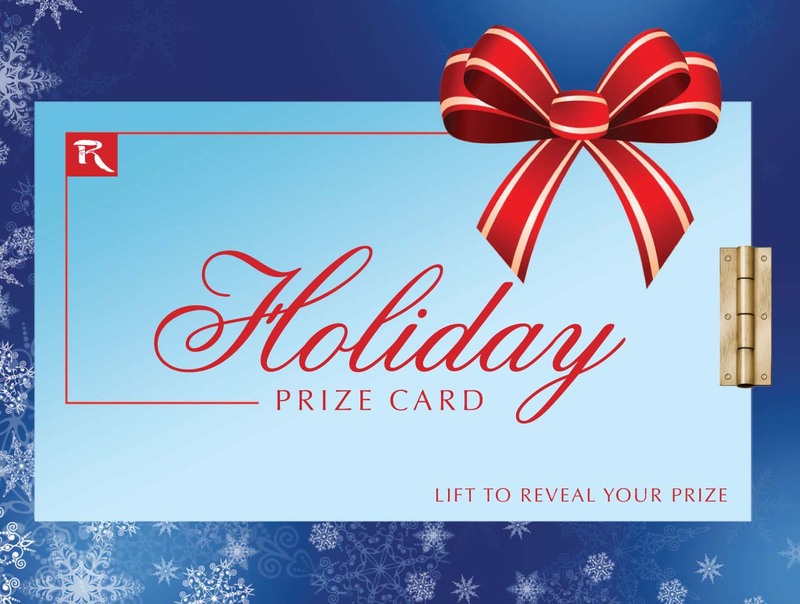 Players simply swipe their card daily for a chance to win. Patrons play a quick playing game and and win a prize based on your budgeted prize matrix. If they make a winning selection, they'll take home your insured prize up to $100,000, compliments of your property, and paid for by Odds On! This kiosk is available in a variety of sizes, Ask how to use this as a guaranteed prize promotion to keep your December budget on track! Reward your players big this holiday season with Odds On Promotions' Video Scratch & Win Hot Seat Tablet! Selected players simply select six spots on the handheld tablet's touchscreen, and if one lucky player happens to unveil six winning grand prize symbols they'll take home your insured prize up to $100,000, compliments of your property and paid for by Odds On! Smaller cash prizes and free play can be awarded to those who locate fewer winning symbols. Looking for an affordable promotion for the holiday season? Odds On's custom Pull-Tab and Scratch & Win Cards could be just the ticket.